"The Alta Marca area near Treviso has been renowned for its excellent wine as far back as the Middle Ages. Excellent white wines have always been produced here, and, as recorded in 1606, were exported and appreciated "in Venice, Germany and as far afield as Poland". 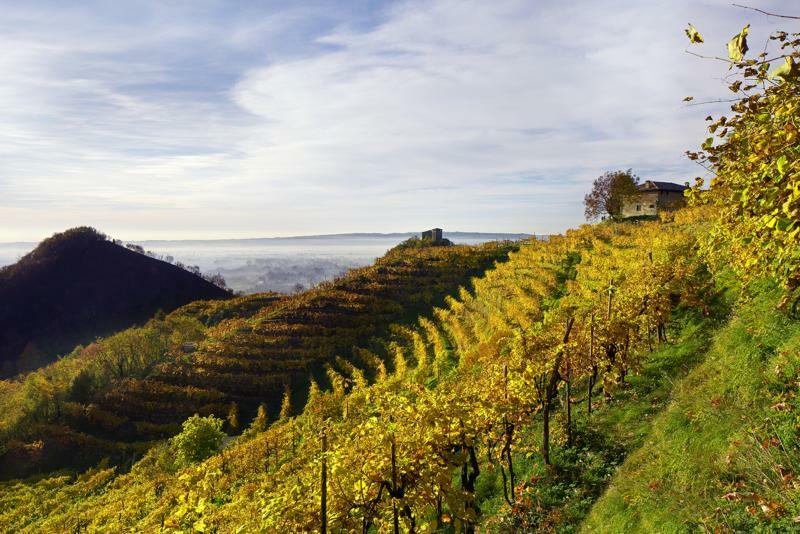 It was a process of natural selection that saw glera become the variety of choice for wine making in this area of the Alta Marca, especially in Valdobbiadene, where the variety dominates the steep slopes of its hills. The environment may seem forbidding, with the Dolomites in the background, but is sheltered and blessed by warm midday sun. It is here, amidst hardworking farmers and solid traditions, that our story begins. In 1920, Abel, the grandfather of the current owners, purchased a natural amphitheatre vineyard from Count Balbi Valier. This beautiful site with fantastic potential was the ideal place to start out afresh, with the help of his son Adriano. Abel had the inspired intuition of separating this vineyard from the others, due to its different characteristics. So it was that he presented in August 1933, at the 1st Mostra Mercato dei Vini Tipici d'Italia in Siena, his Riva Giardino Asciutto, the first real vineyard selection from Valdobbiadene."